Here at Home Make It, we believe the best kind of gift is the gift that keeps on giving and giving! We hope to inspire you and your family and friends with some great ideas, superb kitchen equipment, new culinary skills and healthy homemade produce to share with others. Keep on giving and sharing the love everybody and just watch it all come back to you. The beauty of this "gift of giving" is that if you keep up the wine additions, the red or white wine or balsamic vinegar never runs out! The mother culture will continue to improve with age. Your friends and family will be so appreciative that they'll keep you in a lifetime supply of homemade vinegar. How good does that sound! I'll share with you the vinegar recipe as featured in our first ever book, titled The Makers, by Rita Erlich. This is the recipe of Lou Baggio, the original founder of Home Make It, who knows that not everyone has the time to make real vinegar the old fashioned way, but understands that people still want good quality vinegar to enjoy with their salads and as a stable in their kitchens. So here is his vinegar recipe with a modern twist. Add 250 mls of sterilised water. The water will lower the alcohol content and ph level to 3.8-4, which will allow the bacteria to grow. Cover the jar or demijohyn with a tea towel or gauze. This will allow the mixture to breath and the bacteria to grow. Keep the vinegar somewhere warm to get it to over 24 degrees, which will enable the bacteria to grow. It will take around 6-8 weeks for the vinegar to be ready, less time in warmer weather. Once you've made the vinegar, you don't want it to run out. Continue with wine 'additions' whenever you draw the vinegar i.e. if you take 200ml of the vinegar, replace with 150ml wine and 50ml of sterilised water. This will keep the mother culture going. The vinegar flavour will improve with age if you keep the additions going. Who doesn't love cheese! Whether it's Ricotta, Feta, Halloumi, Blue Vein, Camembert or Mozzarella, we can never get enough. The passionate foodie will love trying their hand at homemade cheese making and the process has been made simpler with these awesome Cheese Making Kits. A little hint...pick the style/flavour of cheese you enjoy, so when they give you the gift of homemade cheese in return....you get to relish and enjoy it! You can just read the mind of Inspector Montalbano, can't you? Do you think he's thinking "OMG, how good are these!" His lady friend looks like she's beside herself with amazement at the delightful taste. We let the cat out of the bag about Italy's best kept secret, the Arancini Moulds a few months ago, with out dedicated news blog titled "Italy's best kept food secret". If you missed it, you can catch up here. The blog included everything you need to know about making arancini, including a You Tube clip by the makers of Arincinotto, easy to follow recipe and step by step images. These arancini moulds have been a best seller since. And by popular demand, we have now imported the 80gm and 120gm hand-crafted pro range of arancini moulds. I must warn you though, they are on the pricey side. However, they are hand-crafted and part of the professional hospitality range. If you get in before Christmas, you can take advantage of the 20% discount we are offering for a limited time or until the stock runs out. Details for the 20% discount below. Anyway, back to the gifts that keep on giving. You give the mould, and hopefully in return they'll give you some scrumptious, perfectly shaped arancini balls. With Summer here, some days the only real way to quench that thirst is with a cold, crisp beer! And what mancave doesn't need a homebrew kit? The beauty of the gift of giving a homebrew kit, is that it includes all the start up equipment needed to brew beer. All they need to then do is choose their flavour/style of recipe, and get brewing. They'll be so grateful that they'll be giving you slabs of beer in no time :) We also have a massive range of recipe kits to compliment the equipment kits. If you know your family and friends are really into homemade food and beverages, but you don't know for sure what they would like to make, then consider the gift of The Makers, by Rita Erlich. The gives a lovely history of European immigration to Australia and the influence the migrants have had on our food and beverage culture. The book also includes recipes and processes to make homemade passata, salami, wine, beer, cheese, pasta and preserved olives. These recipes have been provided by the Home Make It community who are preserving traditions of their homelands, or starting new ones. Well I hope that I've inspired you with some ideas to spoil your loved ones this XMAS. And don't forget it's 'the act of giving that opens the doors to receiving'. Cheeky I know! There's a lot of buzz about the opening of The Craft & Co in Smith Street, Collingwood. We're especially excited as we look forward to teaming up with them and utilising their onsite 10 hL brewery, purpose built cheese and cured meat rooms and training facilities. Watch this space to learn more about our upcoming collaborations in all things artisan food and beverages! Keep up to date with all the news about the newest kid on the block, by joining The Craft & Co mail subscription. You can also keep up to date with all the exciting venue news by following them on FACEBOOK, TWITTER and INSTAGRAM. Be sure to get on down to Smith Street and enjoy The Craft & Co experience. You may also be able to tick off a few gifts from your Christmas list! They have a fabulous range of locally produced and artisan food and beverage products in their retail spaces. With Christmas only two weeks away, you may be still pondering over your list of loved ones that you want to give a special gift to. If your family and friends share your passion for creating homemade food and beverages, then why not spoil them with one of our unique gift ideas? Our gift to you this Christmas is a HUGE 20% discount across the entire store only for a limited time and only while stocks last! Excludes food & beverage courses, gift vouchers, brew tins and essences. To receive the 20% discount, you must enter and apply the discount code “XMAS” at the final stage of check-out (after processing payment via PayPal). Image: Sausage Making Workshop - A Hen's Night with a Twist! We have introduced some fantastic new courses in the 2016 program that are sure to inspire all foodie types, and of course the usual favourite courses are still part of the program too. We are thrilled to be joining The Craft & Co for a collaboration of all collaborations for the Melbourne Food and Wine Festival, Craft Day Out on Sunday the 6th March, 2016, at The Craft & Co, 390 Smith Street, Collingwood.The Craft Day Out will delight, inspire and educate the discerning foodie within, with a series of interactive appreciation and workshop sessions to learn the artisan craft of making beer, spirits, passata, cheese, salami/sausages and wine. Tickets selling ONLINE now. Get in early! We have had a big pre-xmas shipment of big boy toys come into us this week and I'm excited! This is the interior of the new SS Brewtech Infussion mash tun. Has to be seen in the flesh and picked up to be truly appreciated. It's built like a tank. We have also got the 38, 57 & 76 liter SS Brewtech Kettles back into stock, so include those on your Santa wishlist. To add to this, these are 20% off too for a limited time, it's a no brainer! We had a wonderful time with James Mele at The Meat Room in Kilmore last weekend. With our powers combined we gave a "Beer & Bangers" experience for some lucky customers. As well as learning the processes, they took home the fruit of their labours, with everyone hauling away their own handmade sausages and beer bottle by their own hand. A good day had by all! Come along to learn how to set up your own backyard home brewery by booking into one of my Intro to All Grain Brewing courses in 2016. Viking Malts have started to hit brew set ups this week as word gets out about the new kid on the block and it's ridiculously competitive price! We did a bulk buy to some local brew clubs, so look forward to some Viking in a glass near you soon. Don't forget our last day is 24th December, and we open again on the 6th of January, 2016. So if you want to brew over the break, come in and fill your santa sack beforehand. Happy Brewing & don't forget to leave one out for Santa! Home Make It Clayton and Reservoir Stores will close on the Christmas Eve Thursday 24 December, 2015 at 5pm and will re-open as per usual on Wednesday 6 January, 2016. Please note also, that any online web orders made between Saturday 19 December, 2015 and Thursday 7 January, 2016 may not be processed and fulfilled until Friday 8 January, 2016. Click the link below to check out this week's Specials. Check out our Gift Vouchers and Course Gift Vouchers also available in store or ONLINE. We'll be seeing red on our return from the festive season. Our favorite season is fast approaching! The humble tomato season. Are you ready? The Roma tomato also means that the Melbourne Tomato Festival is just around the corner. Be inspired by founder of the Melbourne Tomato Festiva, Guy Grossi in this brief video sharing his inspiration behind the Melbourne Tomato Festival. Remember, you can keep up to date with all the daily news from the team, recipes and events by following us on Twitter or Facebook. Have a great week and enjoy the lead up to the festive season. It's finally arrived! Home Make It's very first book, The Makers: A Story of Food, Family and Foreigners is now available for purchase at either our Reservoir or Clayton Store, and ONLINE. The Makers, written by acclaimed food writer and journalist, Rita Erlich tells a story of European migration to Australia and the influence on Melbourne's food and beverage culture. The book includes the history behind Home Make It and shares stories, recipes and processes from the Home Make It community. The Makers is a celebration of food and beverage traditions including passata making, salami making and wine making. We hope you'll enjoy it. We were delighted to officially launch the book last Wednesday night at The Craft & Co in Smith Street, Collingwood. This venue is going to be big! If you're a passionate foodie, brewer and love artisan produce, then you'll be inspired, entertained and enthralled by The Craft & Co. Keep up to date with all the opening news by joining their mail subscription. You can also keep up to date with the very latest developments by following them on FACEBOOK and TWITTER. The opening is literally days away! So be sure to get on down to Smith Street and enjoy The Craft & Co experience. Here's a few pics from the book launch at The Craft & Co. If you'ld like to see some more highlights from the evening, check out our Facebook Album. Image: The Makers book launch at The Craft & Co. Image: Paul Baggio officially launching The Makers. Image: food writer and author, Rita Erlich. Image: Lou and Celeste Baggio with Rita Erlich. Image: the Salami Makers, BSG Group, winners of the inaugural Melbourne Salami Festa 2012 and featured in the book. Image: the wine makers, Two Brothers and an Outlaw featured in the book. Image: the passata makers, featured in the book. Image: The Craft & Co's Head Chef, Dom Marzano and team. Image: The wine maker's wives and guests at the book launch. We have a winner for our book giveaway... Congratulations goes to Liz Giusti from NSW! We hope you enjoy your copy of The Makers. With Christmas only weeks away, you are no doubt pondering over your list of loved ones that you want to give a special gift to. If your family and friends share your passion for creating homemade food and beverages, then why not spoil them with one of our unique gift ideas? Here's our top 5 unique Christmas gift ideas for your foodie enthusiast friends and family. We are excited to be releasing details and dates for our delicious line-up of 2016 Food & Beverage Workshops. We are now taking bookings, so check them out ONLINE now. Get in early and organise your foodie plan for next year, purchase your friends a Course Gift Voucher for Christmas and bring them along too. We have introduced some fabulous new courses in the 2016 program that are sure to inspire all foodie types, and of course the usual favourite courses are still part of the program too. Busy times indeed in the Home Make It brew department! We have had the new to Australian shores Viking Malt hit the stores. Add to that this new "grain station" (pictured above) that we have set up in stores; we are now ready for any recipe you brewers throw our way! We also do the Viking Malt in sacks too at really good prices, call our stores for availability. And last but not least, we are seeing a new shipment of SS Brewtech hardware in any day now. As well as stocking up on brew kettles, we will finally be seeing their lovely new 38L Mash Tun. I can see this in my set up too! So get those beers brewing for the festive season and come and see us if you need a hand. Click link below to check out this week's Specials. Don't forget, you can keep up to date with all the daily news from the team, recipes and events by following us on Twitter or Facebook. "To eat is a necessity, but to eat intelligently is an art." Springtime evokes the desire to preserve the sweet fruit and vegetables that have been in abundance such as strawberries, pineapple, melons, mandarins, rhubarb, blood oranges, beetroot, spinach and artichokes. Preserving our favourite foods means we can keep enjoying the goodness of these fruits and vegetables long after the harvest is over. Traditional preserving methods include canning and dehydrating. But the quickest and simplest way to preserve fruits and vegetables is freezing. If you're feeling inspired, check out The Kitchn's blog 10 Ways to Preserve Summer Fruits & Vegetables without Canning. There's some great tips on making pesto, fruit vinegar, freezing Summer fruits and roasting tomato sauce and garlic. If you do want to try your hand at dehydrating your favourite fruits and vegetables, take a look at our range of dehydrators online and in store. The range includes the EZIDRI Classic Everyday, EZIDRI Snackmaker and the EZIDRI Ultra FD1000. Vacuum sealers are also a great way to extend the lifespan of your preserved fruit and vegetables, especially when using the freezing or dehydrating method. Vacuum sealers preserve food 3-5 times longer than food stored in plastic bags or containers. Preserved fruit and vegetables once vacuum sealed and frozen will last for 2 to 3 years. Vacuum sealing your preserved foods also eliminates the unpleasant taste of 'freezer burn'. For the highest quality domestic Vacuum Sealing Machine, take a look at our Italian Made SICO Vacuum Sealing Machines. We have a large range that caters for every purpose and budget. Don't miss out on all the festivities at this year's Australian Cider Festival. It's all happening this Saturday 10th October from 12noon - 8pm at the beautiful Ormond Hall, The Village Melbourne. There will be numerous styles of ciders to sample, tasty cider and food pairings to relish, cider master classes to participate in, all whilst enjoying the live entertainment and more. Visit our display stand at the festival this Saturday at 2pm as Home Make It teams up with cider judge and author Claude Jolicoeur during his tour in Australia. Come by to meet Claude and grab yourself a signed copy of his latest book The New Cider Makers Handbook, which is an invaluable and comprehensive resource for home cider makers. To help celebrate the Cider Festival, we are squeezing in one more Cider Making Course for 2015 at our Clayton Store on Wednesday 18th November, 6-7.30pm. If you are keen on cider; then book in your spot online now to learn first hand about setting up your own backyard cider making equipment and be on your way to producing fresh homemade cider in time for Summer! More Cider Making Course dates for 2016 to be released soon. Learn to make home brew and sausages from the experts! Join Steve Lamberto and Cade Butler from Home Make It with James Mele from The Meat Room and enjoy a fulfilled day making home brew and fresh sausages at these brilliant Brew & Bangers classes. These are full day classes and you will get to take home the freshly made home brew and sausages. There will be pizza from the wood fired oven for lunch, morning tea provided, unlimited tea/coffee and home brew tastings are included as well. All equipment and ingredients will be supplied. Bookings and payment can be made by phoning Kathy on 0419 242 815 or emailing info@themeatroom.com.au to reserve your spot today! This weather is making me thirsty! Fortunately, the same weather is also perfect for brewing and fermenting. So in honor of this we are taking 10% off our entire Grain range, Online and in-store. To follow on with your brew we have a great range of Wyeast, White Labs, Brew Cellar yeasts and approximately 20 hop varieties all in our fridges, waiting for your recipe. Some nice fittings recently landed to help you along on your brew days. We have just got in some malt mills, high temperature pumps, high temperature silicon hose and matching 13mm barb fittings to connect all your brewing equipment. We are thrilled to be releasing details and dates for the newest of our in store workshops! Join us for a hands-on workshop in Pickled & Marinated Eggplants with Dario from L'Arrosticino Stick on Grill at our Clayton store on 9th November, 2015 and Reservoir store on 10th November, 2015. Book ONLINE to secure your place. We have now released new dates for our Sausage Making Courses at both our Reservoir on 21st October, 2015 and Clayton store on the 28th October, 2015. James Mele will teach you everything you need to know to make fresh, tasty, healthy sausages all year round. Book ONLINE now to secure your place. Join us for an introduction to All Grain Home Brewing Course in October at both the Reservoir and Clayton stores. Learn all about equipment needed, grains, hops, yeast, how to mill, mash and all maturation/fermentation and bottling techniques to make your favourite styles of grain beers. Book ONLINE. If you love a good drop of red or white wine, and have an interest in homemade wine, then don't miss Eltham and District Winemakers Guild's 46th Annual Eltham Wine Show. Due to the huge success, the show will again be held at the Veneto Club in Bulleen on Sunday 15th November, 2015 from 10.30am for the Wine Show Public Tasting, concluding at 2.30pm with the Awards Presentation at 12pm. Home Make It will also be there facilitating a Sausage Making Demonstration. If you are planning on entering your homemade wine into the competition, the closing date for entries is the 10th October, 2015. You can pick up an entry form from either our Reservoir or Clayton stores or you can enter ONLINE. Check out our new look Gift Vouchers and Course Gift Vouchers also available in store or ONLINE. Or maybe you would like to spoil your mum and have a go at making some healthy 'old school' style food and beverages for her. It can be very rewarding, well worth the effort and she'll love you for it. We have a massive range of pasta machines with different attachments for different shapes and styles. Our electric Napoli pizza oven is Italian made and cooks pizzas to perfection in under 5 minutes! Temperature heats up to 470°C. We also have a large range of pizza making accessories. Our Cheese Making Kits make a unique Mother's Day gift. The extensive range of kits include Ricotta and Mozzarella, Greek Feta, Camembert and Blue Vein, and a Premium Cheese Making Kit for all varieties of cheese. We have recently launched our own complete Sausage & Salami Equipment Kits and Sausage Recipe Kits which will make a fun Mother's Day gift idea that will delight any foodie mum all year round. If you're extra nice to your mum, she may even make you some salami this winter! If your mum enjoys a good cook book, we can highly recommend the newest in the series by Mangia! Mangia! Gatherings: The Spirit of coming together. We have an extensive range of books for foodies, including Chees Making, Preserving, and Cider Making that will compliment any cooks kitchen library. For other unique and fun gift ideas for this Mother's Day, check out our ONLINE store. Still don't know what to get mum this Mother's Day? What about a Home Make It Gift Voucher? You can't go wrong with a Gift Voucher. Our Gift Vouchers can also be used for our Food and Beverage Courses. Introduction to Homemade Winemaking & Appreciation: Hurry only a couple of places left! - Free but registrations essential. Book here. - Special price of $70 for the Darebin Homemade Food & Wine Festival (Ensure to use discount code ‘SAUSAGE’ when checking out via Paypal to receive the discount). - Free. Bookings not required. With the Melbourne Salami Festa. Assisted by Home Make It. Celebrate the garage to plate philosophy practised by Melbourne’s salami makers and learn to make salami with the Melbourne Salami Festa 2014 champion Bernard Holbery. Sessions include breaking down a pig and a hands-on salami making lesson that finishes with a meal and important advice on curing techniques. Learn how to make halloumi and ricotta cheese at home with this fun and hands-on workshop with Gerard, a Cheese Maker from a Victorian Artisan Cheese Company. Halloumi and Ricotta Cheese Workshop held at our two convenient locations, Clayton 26th May, 2015 and Reservoir 2nd June, 2015. For those disappointed that they missed securing their place at the Hot Spanish Sausage Workshop at the Darebin Homemade Food & Wine Festival, we will be running several workshops with butchery expert, James Mele in-store at Reservoir and Clayton throughout the winter months to have you making your own delicious and fresh sausages, and curing your salumi like a professional! Check out all the dates for our Salami and Cured Meats Courses and Sausage Making Courses at our Reservoir and Clayton Stores. Click on our sale banner above for this week's specials. We couldn't let Mother's Day go by without a tribute to recent Internet sensation Nonna Paola. Italian Mother's and their sons. But we're not stereotyping :) Enjoy! On behalf of the team at Home Make It, I would like to wish all the mums a very special Mother's Day, filled with love, homemade food and great wine this Sunday. "If baking is any labour at all, it's a labour of love. A love that gets passed from generation to generation". Can you whip up a chocolate cake with your eyes shut, make sausage rolls like a master and bake a dozen scones without a recipe? If baking is your specialty, The Great Australian Bake Off needs you! Based on the highly successful BBC series, culinary icon Maggie Beer and acclaimed chef Matt Moran are looking for passionate bakers to apply for the newest Australian TV series on The LifeStyle Food Channel. You'll be put to a series of baking tasks, and then only one will be crowned Australia's best amateur baker. If you think you've got what it takes, then don't hesitate! Applications to be a contestant close on the 1st May, 2015. Apply ONLINE now! For more SUPER SAVINGS during our 1 WEEK ONLY end of passata season sale, click HERE. James Squire Brewhouse and Home Make It have come together for a unique collaboration with a fabulous sausage making workshop, a four course dinner and craft beer matching event! Pizza Making Course with Executive Savoury Chef, Michele Circhirillo at our Clayton Store will be running a hands on workshop to teach you the tricks of the trade for authentic pizza making. Book ONLINE. - Free but registrations are essential. Home Make It will be running a number of Salami and Cured Meats Courses at our Reservoir and Clayton Stores, with Butchery expert, James Mele. Home Make It will be running a number of Sausage Making Courses at our Reservoir and Clayton Stores with butchery expert, James Mele. Busy week in beer land, with the SS Brewtech range hitting stores and now available online as well. To continue the beer making story right to the end, we now are carrying 19L Cornelius kegs instore and online to dispense all of your beer goodness. These can be carbonated with the Brewmate CO2 bottles we now carry also, how convenient! On the ingredient side of things, the hops fridge is bursting with a HUGE variety of hops, our White Labs range is extensive and our grain range is ever growing. As well as the pre-packed bags of grain we do, we will now be offering a select range of base grains in 25kg sizes for those brewers who like to buy and brew big. Please call our stores to check availability. On a personal note, I brewed a dark IPA last week that I will be entering into a speciality IPA competition in June at the Terminus in Fitzroy. Some 2Row, wheat, crystal and chocolate grains plus mountains of Summit, Amarillo, Cascade and Centennial hops went into this black beast, and will be finished off with some oak chips before bottling. This competition is the first run by the Merri Mashers, a wonderful brew club we work with. So if you’re a home brewer and do a decent IPA , round up all your hops and come along to sign up. Should be a great day! Be sure to get some advice from our team for the 2016 Vintage if you are looking for great quality grapes. Don't forget to bring in samples of your juice/wine for analysis and advice following fermentation, during the racking process and before bottling. You can keep up to date with daily news from the team, recipes and events by following us on Twitter or Facebook. We are delighted to be sponsoring the Darebin Homemade Food and Wine Festival again for 2015! The Darebin Homemade Food & Wine Festival is a community celebration of sustainable food practices and the preservation of food and beverage traditions. The spirit of the festival resonates so strongly with the ethos and philosophy of Home Make It, and we are thrilled to be presenting several of the workshops and demonstrations that will be showcased over the course of the festival. The full program is now out, pick up a booklet from our Reservoir Store or check it out online and pencil in to attend the array of great events in your calendars, it's all happening from Monday 11th - Sunday 17th May. There will be lots of unique cooking demonstrations during the week in various locations around the City of Darebin. Most events are free, however it is essential to register online. Book in early as places will be limited. If you have made homemade wine, passata, preserved olives or ajvar or are a keen home brewer, we would love you to enter your prized produce into the Darebin Homemade Food & Wine Festival competition. There are great prizes to be won, including Home Make It vouchers and hampers. To enter your wine, beer or passata, just follow the link for the ENTRY FORM. Entries close 6th May, 2015. Introduction to Homemade Winemaking & Appreciation with Steve; Tuesday 12th May, 6.30pm at Preston Shire Hall. Free event however registrations are essential. Hot Spanish Sausage Making Course with Steve; Thursday 14th May, 6pm at Home Make It, 265 Spring Street, Reservoir. We are offering a special price of $70 for the Darebin Homemade Food & Wine Festival, every booking will also receive a FREE Sausage Recipe it valued at $33. Register via Home Make It, and ensure to use the discount code "SAUSAGE" when checking out (after Paypal payment process). Home Brew for Beginners Workshop with Cade; also as part of the Good Beer Week; 12.00pm, Saturday 16th May at Preston Shire Hall. Free event, however registrations are essential. Make Your Own Feta at Home with Cade; at Saturday 16th May, 3pm at Preston Shire Hall. Free event, bookings not required. Salami Sessions 2015 supported by Home Make It and presented by Melbourne Salami Festa are also part of the Darebin Homemade Food & Wine Festival program this year; with sessions being held Saturday 16th and Sunday 17th May at the Northcote Town Hall. For more details about these sessions or to book online visit the Melbourne Salami Festa website. Here you will also find details of more salami sessions being held over most weekends in May 2015. Meet the Makers will be showcased on Saturday 16th May at the Preston Shire Hall from 1pm until 4pm. Come along and meet the locals who have entered their homemade wine, passata and homebrew into the competition. The winners will be announced on the day. There will be free wine and beer tasting and demonstrations running throughout the afternoon. Enjoy the music and entertainment and much more. This is a free event and bookings are not required. know with certainty when the grapes were picked. Note: If you have purchased your grapes from the market, side of the road or off the back of a truck, you really won't know with certainty, any of the above. We recommended our customers to buy their grapes directly from wineries. The winery will be able to let you know when the grapes should be picked and the variety of grape you have purchased. Visit our Reservoir or Clayton stores for recommendations and details of good quality grape suppliers in your area. You can book your grapes in advance, pick your own grapes or organise home deliveries. Tip: Yes, you may pay more initially for grapes purchased at wineries, but you'll spend less on your overall winemaking process in the long run. 2. When making homemade wine, you must sterilise all your equipment! This does not mean just washing your equipment with warm water. You must use food grade sterilising agents. Any contaminants and bacteria present is the single biggest reason for producing poor quality wine. So sterilise, sterilise and sterilise! 3. Ensure to use good quality equipment and wine storage containers that are food grade. We've seen all sorts of equipment used from home and storage containers that are loaded with bacteria and contaminants. 4. After the grapes have been crushed and on-skins, you would ideally plunge the skins every 3 hours, for best results. At a minimum we would recommend plunging three times a day, before the pressing of the grapes. 5. When making homemade wine, as opposed to homemade cooking, exact measurements of all ingredients and additives is important! "A little bit of this and a little bit of that" rule does not apply to homemade winemaking. Be accurate and proud! Use exact measurements and avoid experimentation. We can assist you with the correct quantities of yeast and additives for your wine batch. 6. Bring samples of juice in for testing at all stages of the wine making process. Get your sugar level and ph levels right, and be sure that the fermentation process has completely finished. Know when it's time to bottle. Use the correct yeast for your grape variety. Add additives to correct or enhance your wine. Use fining agents when necessary. Take advice! And remember, we don't use chemicals we use additives. They are all naturally made. Our expert staff will guide you to correct any wine faults or enhance the quality of your wine. 7. Look at the temperature at which you store the wine during the fermentation process. A cold or hot environment will damage the quality of the wine. A warm environment for the fermentation process to occur is best (22°C to 24°C is optimum). Use thermometers to monitor the temperature of the room that you are storing the wine during the fermentation process. There are many options to warm or cool down your storage containers; from immersible heaters, blankets, electric blankets or bags of ice for cooling etc. 8. Racking is an important process in the wine making process. The racking process separates the sediment that accumulates at the bottom of the storage container and needs to be separated from the liquid. The racking process should be done at the very least 2 to 3 times during the wine making process. Make sure to use a food grade siphon the liquid from one storage facility to the next, leaving the sediment behind. 10. Take advantage of our equipment for hire! Take the manual hardship out of the grape crushing process with our electric crusher-destemmer. Also available for hire is our quality, Italian made press and corker. Call our Reservoir store on 9460 2777 or Clayton store on 9574 8222 for more information, availability and hire bookings. Pizza Making Workshop with Michele Circhirillo, Executive Savoury Chef of Brunetti on the 7th May, 2015 at our Clayton store only! 6-8pm. The workshop concludes with a shared pizza feast. Salami and Cured Meats Courses in May, June and July, 2015. Learn the ancient art of meat processing and curing with this informative and interactive course, led by the cured meats and butchery expert James Mele. Book ONLINE. Sausage Making Courses in August and October, 2015. Learn how to make delicious homemade sausages with our hands on workshops. Busy Easter weekend of brewing and bottling for you all I hope. We have some new products coming into store in the next couple of weeks. Firstly, our Swap n Go CO2 bottles are in store now and at $25 per swap for the 2.3 & 2.6kg bottles, it’s a real bargain. Secondly, the SS Brewtech range will grace us with it’s presence next week. So for all your shiny fermenting and brew boiling needs, come in and see us. And last but not least, we will soon be popping some of the highly regarded Gladfield speciality malts onto our shelves to spice up your recipes. Happy brewing & hope to see you soon! With the tomato season all but over for another year, take advantage of our huge "END OF SEASON, PASSATA SPECIALS". For all our Nonna Paolo fans, here's another You Tube clip on of the iconic internet sensation, asking SIRI "the time in Italy"on her IPHONE". Very entertaining! Have a great weekend. "Red, red wine...stay close to me"
I wanted to share this You Tube video by Tony and Maria, on How to Make Homemade Wine. Maria and Tony are passionate about homemade wine and look like a beautiful family. Tony uses old fashioned winemaking equipment and is quick to point out that he makes wine using a traditional method that does not include the use of "chemicals" as he puts it. We don't tend to use the word "chemicals", in fact if you refer to "chemicals" at the Clayton store, you'll be fined! Instead, we use the word "additives" because they are all completely natural products that can correct faults in wines or improve them. There's nothing worse than having to politely sip your dad's, relative's or friend's really bad homemade wine or vinegar. Whilst there can be resistance from older generations to embrace new ways of making homemade wine, we are discovering a real growth area in "the next generation" of homemade wine makers who are wanting to produce beautiful wines to share with their family and friends. At Home Make It, we still embrace the idea of preserving by traditional methods, however, we also encourage the use of new techniques mixed with the traditional methods for the optimum homemade wine results every season. 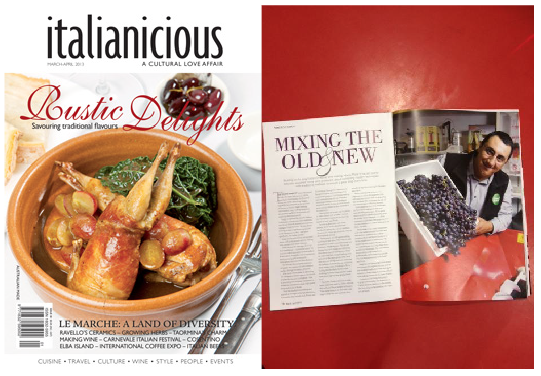 Italianicious Magazine , March/April 2013 edition featured a story about Home Make It, titled "Mixing The Old & New", interviewing Frank Bovezza who talks about the advantages of mixing old and new techniques for making homemade wine. It's a great read and includes a step by step process to making homemade wine. We are thrilled to announce the commencement of a new member of the Clayton team, Matt Drew. Matt is a member of the Frankston Amateur Winemakers Guild and will be assisting us with the wine analysis and customer service a few of days a week. Matt is passionate about making homemade wine and is also an enthusiastic foodie. He's an all round expert on homemade salumi and enjoys annual passata making. Our stores provide a complimentary wine testing/analysis service to all our customers for all the stages of the winemaking process, including crushing, pressing, racking and bottling. So please feel free to bring in a small sample of your juice or wine for analysis. If you haven't purchased your grapes yet, just ask someone in the team to guide you in the right direction for good quality grapes in your area. We have also extended our trading hours to manage the busy wine season. Our Reservoir and Clayton Stores are currently open on Saturdays from 9.00am until 3.00pm (until end of July) and Sundays from 10.00am until 2.00pm (until end of April). Congratulations to Phillip Collings, the winner of our Subscription Competition from the recent Melbourne Tomato Festival. Phillip is the proud new owner of a Sausage and Salami Equipment Kit valued at $125.00 and a Dolce Italian Sausage Recipe Kit, valued at $33.00. I went along to the Good Beer Week Gala Showcase & Program Launch not too long ago and had some wonderful beers and chatted to a few brewers. Saisons were everywhere and I had a really nice raspberry sour beer. I was inspired and went home and started a raspberry saison. Soon enough the combination of Wheat malt, Pilsener and White labs Saison mix 2 were bubbling away in my carboy. The raspberries went in today, pictures of this next week! Pizza Making Course - We are very privileged to have Michele Circhirillo join us for a unique and hands on homemade pizza making workshop at our Clayton store on 7th May, 2015. Michele is Italy born and currently Brunetti's Executive Savoury Chef. He'll teach you all the tricks of the trade and share at the end of the evening, a feast of delicious homemade pizza. Places are limited, so book your ticket ONLINE now. Click on the banner below to discover our weekly specials. With the tomato season coming to an end for another year, I thought it may be nice to end the season with a lovely little Youtube clip of Melbourne's most popular internet sensation, Nonna Poala. Nonna Poala is doing a happy dance because it's her annual passata day and she's feeling happy. Enjoy! Have a great week! It's all happening this weekend in Melbourne...foodie heaven! You have to love Melbourne's food and wine culture! Sunday 1st March, 2015 is going to be a massive celebration of homemade food and beverages. Immerse yourself into foodie heaven and experience one of these great events. Whether it's the inaugural celebration of the humble tomato, the art of salumi making or secrets in homemade sausages, cheese and winemaking, there will be something to delight the foodie within! As part of the 2015 Melbourne Food and Wine Festival, Home Make It will be joining forces with Mister Bianco Restaurant, That's Amore Cheese, Dal Zotto Wines and Canning's Free Range Butcher for a unique Masterclass experience and shared lunch. The Italian Masters will be coming together to teach the art of homemade sausages, wine making and cheese making. Book your tickets at A Taste of Italia @ Home. The inaugural Melbourne Tomato Festival will be held at the stunning and historic Farm Vigano. The festival will showcase local farmers, Italian food and artisan produces, guest speaks in agriculture, cooking demonstrations and entertainment. Bring the kids along for a fun filled morning or afternoon. This is a ticketed event only, so book ONLINE! Our Home Make It team will be running four fun-filled, hands on Passata Making Workshops throughout the day. Gather your family and friends to participate in one of the workshops and take home your very own bottles of passata. Advanced Homemade Winemaking Course - Run over six nights from March - November covering all the stages of the winemaking process. Book now and take advantage of the pre vintage special price! Homemade Cider Making Course - Learn the art of making homemade cider to enjoy with family and friends at one of our hands-on workshops. Pizza Making Course - Learn the art of pizza making by Brunetti's Executive Savoury Chef, Michele Circhirillo. Workshop will conclude with a feast of delicious freshly made pizza. Salami and Cured Meats Courses - Learn the ancient art of meat processing and curing with this informative and interactive course, led by the cured meats and butchery expert James Mele. Sausage Making Courses - Learn the basics of sausage making. If you have ever thought about making fabulous homemade sausages then this is the workshop for you! If you are getting ready to make your homemade wine, we can highly recommend Morgan Vineyards in the Yarra Valley for great quality Pinot grapes that are ready for picking this Sunday. Bring your family and spend a lovely day amongst the vines in the beautiful Yarra Valley. From one of the oldest vineyards in the Yarra Valley. Toilets and picnic tables on site. We hope to see you at one of these fabulous foodie events on this Sunday 1st March! Home Make It is delighted to be offering the Italian-made, HotmixPRO Professional Cooking Gastro; the kitchen appliance that does it all! Chop, cut, mix, knead, cook and more…at home or in the professional kitchen the HotmixPRO has so many unique features, that it out performs any other thermal mixer out there. Watch it in action in this Youtube video. The temperature reaches 190°C which is suitable for the home cook and those who are time poor, but want to create healthy meals with ease. Also suitable for food businesses, professional chefs, production kitchens or molecular gastronomy. We look forward to seeing you at the demonstrations, where you will also see how quick and easy it is to make pastry cream, hollandaise, zabaglione and more.. The inaugural Melbourne Tomato Festival WILL be a sell out! With less than three weeks to go, there are less than 400 tickets left, so if you are planning to join in the celebration, get ONLINE today and purchase your tickets. This is a ticketed event only! Our Home Make It team will be running four fun-filled, hands on Passata Making Workshops throughout the day, so hopefully you'll be able to join us for one of them. If you're keen, be sure to get in early to secure to your spot. For our passionate passata enthusiasts, come along to the Melbourne Tomato Festival Gala Dinner at Merchant Osteria Veneto on Friday 27th February, 2015. Enjoy a four course dinner, including canapés, wine and drinks. Be inspired by Guy Grossi and guest speaker, Teresa Oates, co-author of Mangia Mangia. A hands on Master Class by the Italian masters in homemade sausages, cheese and wine, plus a shared table lunch at the stunning Mister Bianco Restaurant. Purchase your ticket ONLINE to participate in this special event. Home Make It is joining forces with Romulus and Remus Restaurant and Salumi Australia for a traditional hands on workshop in The Art of Salumi making, followed with a feast of Italian food and specially selected wines from Distillery Works. Homemade Cider Making Course - Learn the art of making homemade cider to enjoy with family and friends at a hands-on workshop. Passata Making Course - We'll have you ready for this year's passata making season. A fun, hands on workshop with a shared pasta supper. Pizza Making Course - Learn the art of pizza making by Brunetti's Executive Savoury Chef, Michele Circhirillo. Workshop will conclude with a feast of delicious pizza. Salami Making Courses - Learn the art of homemade salami making with this hands on and informative course, led by the salami and butchery expert James Mele. Place olives in a large container and fill with fresh water until olives are well covered. Change water every day for 10-12 days. Drain the olives and place them in airtight containers with lots of oregano, thick slices of lemon, garlic (to own personal taste), green hot chilli pepper (optional). Continue to layer the olives and herbs until the container is almost full. Boil the 5 litres of water with 500 grams of salt and let cool. Pour the cooled liquid over the olives so all is well covered. Seal the container. It’s always been traditional to the Mediterraneans to coil some wild aniseed, so it will keep the olives under the brine and help with the flavour. Keep the container sealed for 6-8 weeks for black olives and 8-10 weeks for green. Tip #1 – If you forget or miss a day changing water, don’t worry, just continue the process for an extra day. Tip #2 – If mould begins to form on the finished product, remove it and place 4-5 slices of lemon and more oregano on top of the olives. Pricking olives with a needle or sharp knife also will introduce the salt into the olives, giving them extra flavour. Other recipes recommend fresh mint instead of oregano; for black olives only still use garlic and chilli pepper or bay leaves with oregano. **This recipe has been used successfully over the many years and life of Home Make It. Recipe adapted by Celeste Baggio. With the wine season just around the corner, grapes will be ripe for picking very soon. You've no doubt heard the saying "if you want to make good wine, you need to start with good grapes!" We can confirm it's true! We'll be keeping you up to date over the next couple weeks with details of local wineries where we know you will get great quality grapes. Don't forget, we offer a complimentary service for juice/wine analysis at all the stages of the winemaking process. Bring along a sample in store for testing by one of the team. Our newest member of the team, Cade Butler has been busy expanding our range of home brew equipment and supplies are our stores and ONLINE. Come in to our Reservoir or Clayton store to meet him, swap recipes or learn the art of grain brewing. Cade's a passionate home brewer and will be only too happy to share his knowledge and experience in all things home brewing. Ripe, lush Roma tomatoes are now in abundance! We can highly recommend Tony and Maria's tomatoes at 22 Lawson Crescent, Thomastown. Call Maria to order your boxes on 9460 1209 or just drive up, load up and drive off. It's a busy time of year for our team at Home Make It. You can keep up to date with daily news, recipes and events by following us on Twitter or Facebook. Now, we have probably missed the boat on this one, as it seems to have gone viral in the last few weeks around Melbourne, but we thought we would kick off your Friday evening with a giggle, by sharing a little YouTube clip titled, Nonna Tells Grandson, NO Tattoo.